While most of us recognize silk as being soft and smooth, it can also be crisp and textured. Silk fiber is woven and processed in many ways, which determines its appearance, quality and use. As the strongest natural protein fiber, it can also be blended with other fibers to create a sturdy and more versatile fabric. Pure silk fiber has great absorbency, making silk apparel items cool in the summer and warm in the winter. Silk is neither wrinkle or sun resistant, and over-exposure to sunlight will weaken and fade the fabric. Though silk can be hand-washed, dry-cleaning will increase the life and beauty of the fiber. Clothes made of silk fiber are often expensive and have a high perceived value. When silk fiber is twisted in the weaving process, different silk fabrics are created, such as crepe, shantung and satin. Dupioni is a type of Indian silk suitable for men's shirts or women's dresses. The woven silk fiber makes soft, flowing nightgowns, underwear and robes. Chiffon silk is a soft and light silk made from a very highly twisted yarn — strong but still very thin used for women's formal dresses. Raw silk is often used for men's sport coats, women's suits and coats, when layers of liquid serecin is left on the silk fiber a rough and coarse silk is produced — known as "raw silk." Silk chiffon makes flowing curtains and ruffles for pillows and comforters. Matka silk adds texture and thickness to upholstering due to the twist and amount of fibers used in manufacturing. Silk wall coverings give a finishing touch to bedrooms and living rooms. Silk fiber for home furnishings are best used in rooms that receive less traffic and wear as it does water spot and isn't stain resistant. Silk throws and pillows can add colorful additions to your room decor. Silk bedding invites you to spend a restful and comfy night. Woven silk fibers are used for the construction of parachutes and bicycle tires. Silk fibers that undergo a special manufacturing process are used to construct prosthetic arteries. 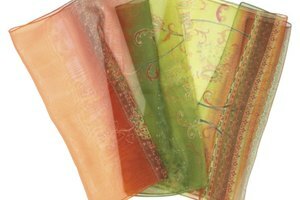 Due to silk's antibacterial properties, it's often used in the medical field for wounds and burns. Many silk fibers are woven into suitable backgrounds for pen and ink drawings and painting. 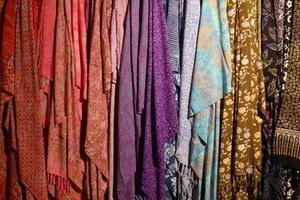 Silk is often blended with other fabrics. Synthetics give silk more stability, as well as sun and water spotting resistance. For sport attire, adding cotton to silk fiber gives strength, stain resistance and body to the fabric. Draperies and upholstery are also more durable and easy to take care of with synthetic fibers mixed with the silk fibers. Carol Stanley has been a writer and speaker for over 30 years. She has written for several Arizona publications including the "Arizona Republic." She attended the University of California-Los Angeles and the University of Arizona. She authored the book "For Kids 59.99 & Over," among other publications. What Are the Dangers of PBT in Polyester Clothing?